The Ukrainian military has started an operation against pro-autonomy activists in the city of Mariupol, southeastern Ukraine, as well as the town of Konstantinovka, according to local self-defense activists. The troops have moved into Mariupol and have surrounded an administrative building held by anti-government protesters. The protesters have set up barricades and are burning tires. There are a few hundred activists inside the building. They told RT that the army is warning them that if they do not leave the building in the coming minutes, they will be fired at and the building will be seized. “I am in the center of the city, there are a lot of ambulances outside the local administration building, gunfire is being heard, armored vehicles have entered the city and are moving towards the center,” witness Tatyana told RT by phone. People on the ground told RT’s Paula Slier that there are 300-500 anti-Kiev protesters there and they are unarmed. There have so far been no reports of injuries. “There is no fatalities so far, but I can’t say anything about the number of injured. Right now police have returned from the scene, but people in dark uniforms can be seen in other parts of the city,” another witness named Dmitry told RT. A bank building has been set ablaze in Mariupol, local news website 0629 reported. At the same time, a convoy of Ukrainian APCs has forced its way through self-defense checkpoints near the Donetsk Region town of Konstantinovka. Shots and alarm can be heard inside the city. There are reports that at least two people have been killed, Paula Slier says. The TV building has reportedly been seized by the army and all transmissions are currently off-air, she adds. Ukraine's acting interior minister, Arsen Avakov, has confirmed that a special operation is underway in the town of Konstantinovka, adding that several soldiers have been injured. In Donetsk, a demonstration against the Odessa tragedy snowballed into an attack on Ukraine’s Security Service building. One of the company’s owners and its executive director is the Kiev-appointed Sergey Taruta, the governor of the region. Meanwhile, in the town of Gorlovka, 40 kilometers to the north of Donetsk, pro-Russian protesters took control of the department of organized crime prevention. Interior Ministry and police employees were temporarily stationed in this building. No injuries or casualties have been reported. Image from maps.google.comImage from maps.google.com National Security Council secretary Andrey Parubiy has said that Kiev is planning to begin special military operations in other regions of Ukraine after it completes its current operations in Slavyansk and Kramatorsk. Over the past few days, Ukraine has stepped up its military operations in southeastern Ukraine against pro-autonomy activists. The main opposition strongholds include Kramatorsk, Slavyansk, Lugansk, and others. In Lugansk, self-defense forces have declared a state of emergency and full mobilization amid Kiev’s punitive military operation in the region on Saturday. 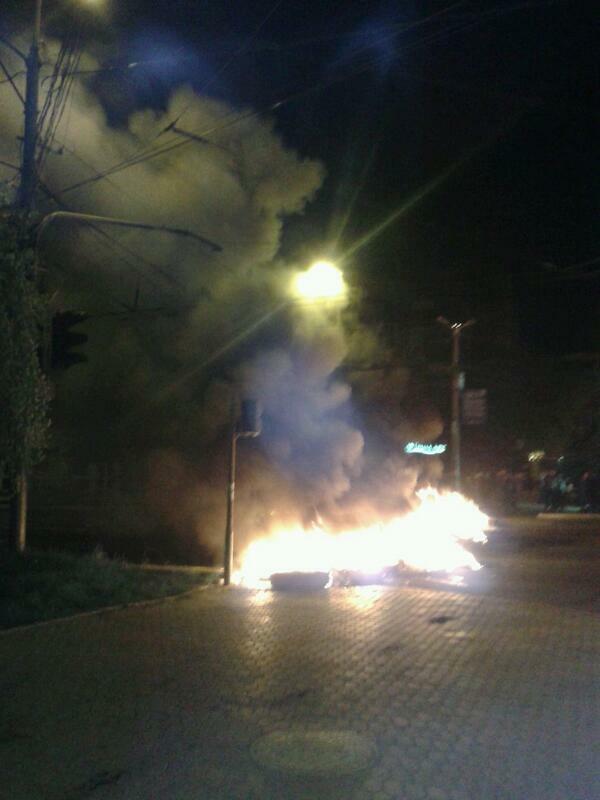 At the same time, outraged residents of Kramatorsk have lashed out at troops entering the city's streets. The Ukrainian military is currently occupying the city of Kramatorsk following an assault early on Saturday, a local self-defense unit said. Activists said that 10 people died in fighting overnight and two others were “killed by snipers.” Meanwhile, clashes between pro-nationalist radicals and anti-Kiev activists have intensified. On Friday, more than 45 anti-Kiev protesters were killed in Odessa; some died in clashes, while others died from burns or suffocation after being trapped inside the House of Trade Unions building by the ultra-nationalist Right Sector group.